Eddie Radwanski walks into First Carolina Deli and he’s home. Everyone knows Eddie here from the owner to every server that passes the table. He has an easy smile and an infectious laugh. Growing up in New Jersey, Eddie was one of the top players in the state, and he played on a state championship high school soccer team. UNCG men’s coach in the early 1980s, Mike Berticelli, recruited Eddie to play soccer at a time when the men’s soccer team was developing into a Division III powerhouse. The success of the team that Berticelli put together is now burned into the soccer legacy at UNCG. Coach Berticelli did the best he could with the resources available at the time. He didn’t even have a soccer field. In 1981, the men’s soccer team practiced wherever they could find space—Greensboro Day School, Grimsley High School, or Guilford College. In 1982, Eddie played his first NCAA Div. III National Championship game, and UNCG won while playing on the field at Guilford College. With the next season came fields of their own. “I remember when they cleared the land to build the first soccer fields. We drove through the quad and coming around the corner I could see the green field in the distance. It was beautiful.” The year was 1983, and UNCG men’s soccer earned another National Championship. This time, 5000 fans surrounded the new soccer field. Eddie was named first team Division III All-American and the professional soccer world took notice of his talents. In 1984, he was a first round draft pick of the Dallas Sidekicks and the next year he made five starts with the US National Team. The only drawback to Eddie’s soccer success was the timing; he was two classes short of earning his bachelor’s degree in business. Even though Eddie had to leave college classes behind, he did study for the Series 7 license to sell securities while healing from an injury. Going through the process, he realized he wanted to get back into classes at a business school. Eddie’s professional career as a player eventually brought him back to Greensboro to play for the Dynamo from 1993 to 1997 and gave him the opportunity to take the business classes he needed and that he missed. After he returned to UNCG, Eddie also noticed the methods his professors used that he started to incorporate into his coaching. 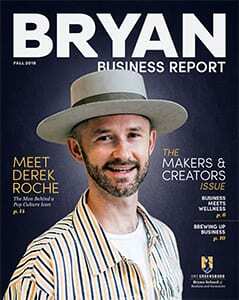 In addition to the differentiated teaching methods he observed at the Bryan School, his business classes helped him consolidate many concepts he had learned on the soccer field and in life. After completing his final course work, he could apply these concepts in his coaching career. Management, finance, and communications all played a big role in his transition to coaching. After he finished his playing career with the Dynamo, Eddie joined the coaching staff for the UNCG women’s soccer team. He took over as head coach in 2001, and the UNCG women’s soccer team won the Southern Conference regular season and/or tournament championship eight of his 10 seasons as head coach. The team also earned the NSCAA Team Academic Award every year from 2001-2010. With Eddie’s drive and keen understanding of communicating with student athletes, it is no surprise that the Spartan women’s soccer team record during his tenure was impressive: 140-65-13. But Eddie is focused on more than competition. He says he is in the people business, and he is always focused on a bigger picture. 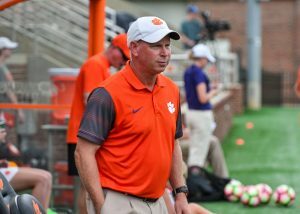 Eddie says leaving UNCG to take the job as the Clemson women’s soccer coach was the hardest decision he has ever had to make, but he has continued to be successful in his new home. 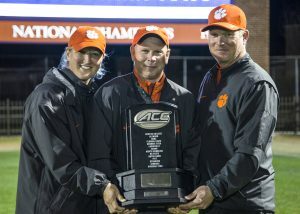 In 2016, Eddie was named ACC Coach of the Year. The Tigers made it to the Sweet 16 this past season, but Eddie highlights the student athletes’ accomplishments in the classroom more than on the field. At Clemson, he has coached six ACC All-Academic players. 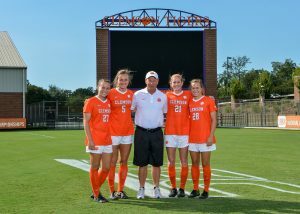 In 2017, four Clemson student athletes were honored with ACC Postgraduate Scholarship Awards; three of four were Eddie’s players.